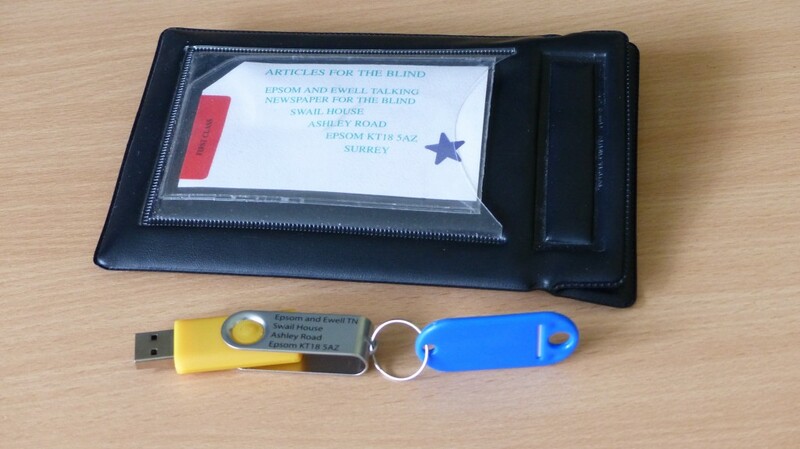 The Talking Newspaper is a service for all those in Epsom, Ewell and surrounding areas who are blind, partially sighted or for some other reason are unable to read normal text easily. You do not need to be registered as blind to subscribe to the service. There is no subscription charge and no commitment. You can stop or start receiving the Talking Newspaper at any time. The Talking Newspaper is distributed on a memory stick and can be played in a computer, in some recent Daisy players, or in a dedicated player, called a “boom box”. If you wish, we are happy to provide you with a boom box for no charge. We can also visit you in your home to demonstrate the boom box and make sure you are comfortable using it. The memory stick is delivered in a plastic envelope. The memory stick is reusable, so we ask that after listening you return it in the envelope. The envelope has a two-sided address label in a clear plastic window, one side has your address and the other has ours. Listeners need simply turn this label over when returning the envelope. you certify that your close-up vision is N12 or less (unable to read newsprint). If you meet these requirements we can send you the memory stick post-free and you do not need to pay postage when returning it to us. Alternatively, customers of the British Wireless for the Blind Fund can listen to the Epsom and Ewell Talking Newspaper on their Sonta Plus web radio player. Listen to this week’s local Epsom and Ewell talking news online.